There is no reason to be alarmed. Just because research has shown that chickpeas do not fix as much nitrogen (N) as is exported in the seed, this doesn’t mean that chickpeas are bad for soil fertility or that you shouldn’t grow them. Chickpea inoculated with Rhizobium alone produced a yield comparable to a crop fertilized at 112 kg/ha. “Almost all pulses do export more nitrogen than they fix. Based on the literature, legume crops can fix about 70 to 80 percent of total N use. The rest must come from the soil. It doesn’t matter how good fixation is,” explains research scientist Yantai Gan, at the Semiarid Prairie Agricultural Research Centre, Agriculture and Agri-Food Canada at Swift Current, Saskatchewan. The scientist at Swift Current has studied chickpea fertility for many years, and published his most recent study on N dynamics in chickpea in the Canadian Journal of Plant Science. In the study, he looked at the effects of cultivar choice, N fertilization, Rhizobium inoculation and cropping systems on N credits and N use efficiency. The study also provides insight into fertility and cropping practices for both chickpea and the subsequent crop. Four chickpea varieties were grown in the study. Amit is a small-seeded kabuli-type, CDC Frontier a medium-seeded Kabuli type, CDC Xena a large-seeded kabuli-type, and CDC Anna a small-seeded desi-type chickpea. The varieties were sown on either tilled fallow, or no-till wheat or barley stubble. The no-till land had been in place for nine years before the study was initiated. Flax was used as a no-fixing reference crop. Eight fertility/inoculant treatments were used including varying rates of N fertilizer with or without Rhizobium inoculant. The treatments with N fertilizers received urea side-banded 6 cm deep and 3 cm away from the seed. Granular rhizobium inoculant was seed placed. In the study, the application of Rhizobium inoculant without fertilizer increased yield by 40 percent in the no-till barley system and 33 percent in the no-till wheat system, but only 9 percent in the tilled-fallow system. On average, chickpea inoculated with Rhizobium alone produced a yield level comparable to the yield of the crop fertilized at 112 kg/ha. As fertilizer rates were increased, the amount of N fixed was reduced. It took 56 to 112 kg/ha of N fertilizer to produce the same yield as when the chickpea crop was inoculated without fertilizer. Nitrogen use efficiency (NUE) also decreased as fertilizer rates were increased. Gan says that the amount of N fixed as a percentage of total N uptake was 15 percent for non-inoculated chickpea and 29 percent for inoculated chickpea. This resulted in a negative N balance regardless of cropping system. Increasing the N fertilizer rate decreased NUE with the rate of decrease greater for non-inoculated chickpea. 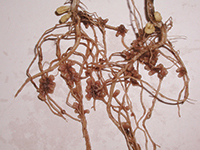 Nitrogen balance was estimated by subtracting the amount of N exported in the seed less the N fertilizer and N-fixation inputs. One missing piece in the study is that it did not take below ground parts of the chickpea plant into consideration when calculating N credits and NUE. Gan summarizes that while his most recent study shows that more N is exported from the soil than fixed, that optimum productivity and N benefits can still be achieved. Growing chickpea on low-N stubble fields and using Rhizobium inoculants is recommended to improve the NUE of the crop and for achieving high yields.